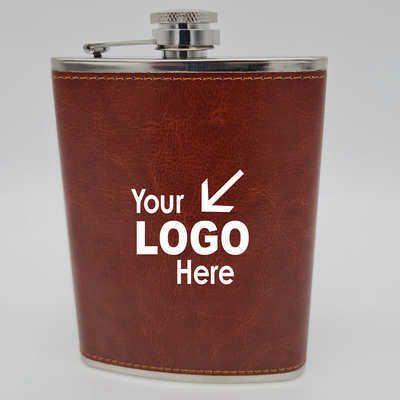 235ml Stainless Steel Flask Wrapped in Elegant Faux Leather. Individually Boxed in Shiny Black Gift Box Marked "Stainless Steel Hip Flask" Colours: Black, Dimension: Box: 145mm L x 95mm W x 24mm D Flask: 122mm H x 95mm W x 21mm D. Price includes : 3 Day Service* Pad Print - One Colour/position . Setup is included.